The much-awaited Indo-Lanka ferry service will resume operations from tomorrow from Tuticorin, with India’s Union Shipping Minister G.K. Vasan flagging off the vessel Scotia Prince. The Scotia Prince can accommodate 1,044 passengers in 307 cabins. The service, initially sailing twice-a-week between Colombo and Tuticorin would boost trade and tourism. The journey is expected to last 14 hours each way. 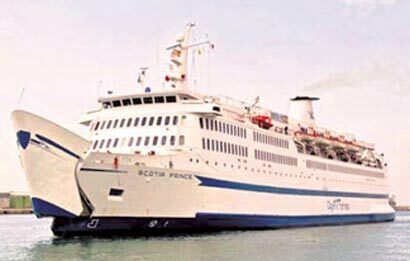 Scotia Prince, a state-of-the-art cruise liner chartered by Flemingo Liners, will have over 40 crew members on board and around 25 ground staff to help with check-in procedures, immigration, customs procedures and baggage clearance. It could carry about 300 tonnes of cargo. The ship once operated between Portland and Yarmouth. The ship has 111 economy rooms, two special cabins for the differently abled, 22 deluxe cabins with toilets, 169 deluxe cabins with showers and toilets, 11 first class cabins and two suites. Onboard features include the “Broadway Lounge”, a restaurant (Concorde), a cafe called Manhattan, a bar, disco and an infirmary apart from a casino, a drive-in-drive-out facility for cars and cargo vehicles and a duty-free shop. According to the operators, a single economy class berth will cost Indian Rs 2,243, a deluxe cabin Rs 2,588, a super deluxe cabin Rs. 2,760 while a first class cabin will cost Rs 10,350. Flemingo Liners has received a licence for seven years with an additional three years. CEO of Flemingo Liners, P K Thimmayya, said that the demand for cruise travel in the country was increasing gradually and that the new service would increase the number of tourist arrivals between India and Sri Lanka. The ferry service, planned for a March launch, was postponed due to the absence of a ship as the Indian government had diverted the vessel to Libya to evacuate expatriate workers who had been stranded there due to political turmoil. The ferry was a very popular alternative to air travel before terrorism broke out in the North. India and Sri Lanka initiated discussions on reviving the service after the LTTE was defeated two years ago.